Compact module for receiving a full DVB-S2 or DVB-S transport stream and outputting it as ASI. With it's fast receiver architecture and advanced signal quality indicators, it is highly suitable for system integration. OEM DVB-S2 receiver with ASI output. Development kit, consisting of DTM-3237, power supply, USB cable, MCX-to-BNC cable assembly for ASI port. For OEM development, we have special volume pricing. Please contact us to discuss your requirement. DtmCmd - Windows/Linux command line tool for controlling the DTM-3200. DtmCmd is an example of using DtmHandler. If you have hooked up the DTM-3237 to a PC via USB, you can use free utility Dtm3237Util to view status, control settings and - if necessary - upgrade the firmware of the DTM-3237. The tool is convenient for initial configuration of the DTM-3237 and for experimentation. 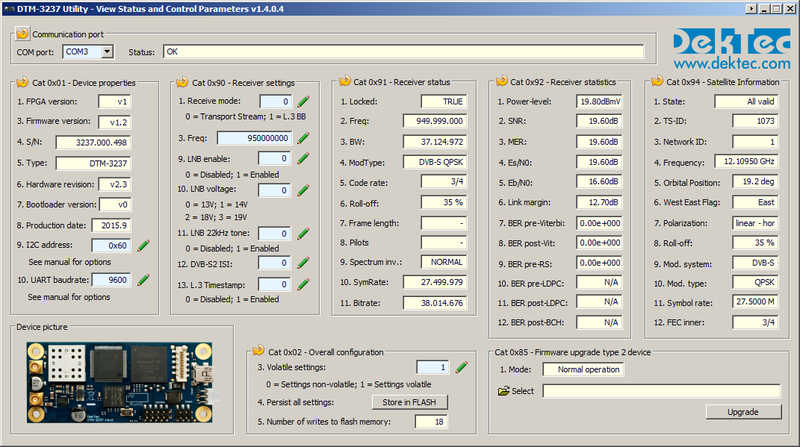 The screenshot below provides an impression of the parameters that can be set and monitored. 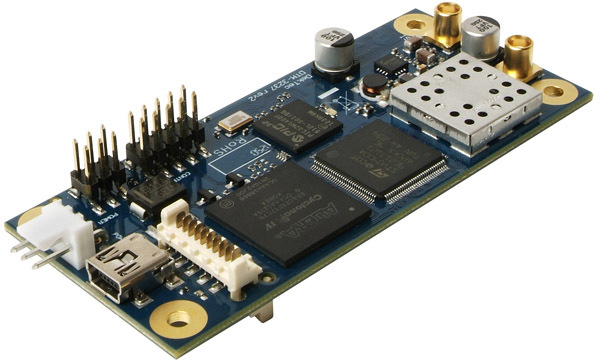 Compact OEM module for interfacing Transport Streams from or to a network. The DTM 3200 converts either from IP to ASI or ASI to IP (user selectable). When combining the DTM-3200 and the DTM-3237, DVB-S/S2 to IP conversion can be realized in OEM form factor. DekTec's PCIe satellite-receiver card for QPSK, 8-PSK, 16-APSK and 32-APSK. With support for advanced DVB-S2 features and LNB power supply, this card is the multipurpose solution for DVB-S2. DekTec's standalone power-over-ethernet enabled DVB-S2 Satellite Receiver, allowing reception of the full Transport Stream and transmit it to IP and ASI networks.